My wife insisted that we see 2016: Obama’s America. Earlier today we hopped into the car and headed to the local theater. After buying a lunch of soda and popcorn, we marched into the theater and grabbed a seat. I was familiar with Dinesh D’Souza’s thesis about Obama, his father and colonialism so I had some idea what the movie would cover. 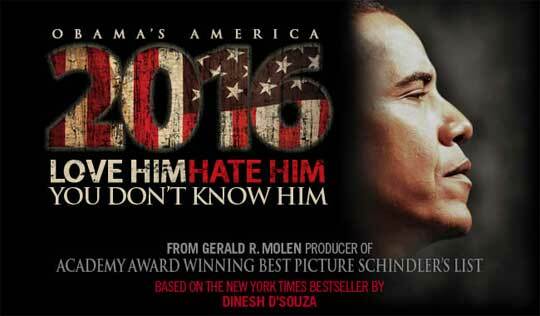 The movie begins with a compare and contrast of D’Souza and Obama. This simultaneously lets viewers meet both men and also lets you know the perspective of the man who brought his book to your local Cineplex. The movie introduces a few actions taken by Obama during his first term in office. These events are ones which many viewers will be familiar and had wondered why? Then it moves to the story of both Obama and his father. Much of the narrative in the film is audio from Obama’s two books. Obama did us the favor of recording both books in his own voice. D’Souza interviews Obama’s family and many that knew him earlier in life or had known his father. The film weaves a more complete picture of the President’s life history than most people have ever heard from their televisions or talk radio. Granted, this movie presents only a thumbnail sketch of these events but the framework is logical and objective. I never got the feeling that I was being manipulated by the filmmakers. Yes, I was seeing what they felt was significant but in most cases I think they exercised good judgment in preparing their story. The highlight of the movie to me was finally getting to see Obama’s brother, George. George was intelligent and very different from his more famous half-brother. Obama Sr. had five wives and died when George was six months old. George lives in a ghetto in a tiny 10 x 10 hut in Nigeria. It was great to see him on the big screen. The movie then tries to explain actions taken by President Obama within the framework of D’Souza’s thesis. It finally circles back to the events at the beginning of the movie. You can almost hear Paul Harvey’s words “and now you know the rest of the story” echoing in your ears. The last few minutes of the film are spent in extrapolating what a second Obama term would be like based on the first term and D’Souza’s thesis. This is interesting especially since Obama has never said what he plans to do if re-elected. I don’t think everyone will agree with D’Souza’s analysis but if you don’t then what explanation do you have that fits the facts better? On this point those across the political spectrum have been silent. Obama’s actions as President defy traditional flavors of Liberalism in American politics. 2016 is the best window into Obama’s life that has been produced thus far.